How Do China's Recent Recycling Changes Effect My Home? What Will the Recycling Changes in China Do to Your Blue Bin? We will no longer be accepting “foreign garbage”. Though these words sound like something that would be uttered during an adolescent quarrel, they were actually the words of a nation that’s become exhausted by their own efforts to clean up the world. The shifts that are being made halfway around the planet may soon show effects on our recycling processes. You’ve probably met a dutiful Oregon resident who spends their time cleaning out their waste right down to the yogurt containers. Or maybe it was a mother who made special trips to return her plastic grocery bags. They sort their recycling in an effort to keep our landfills as empty as possible. This effort may soon be a waste, as what’s allowed to be in your blue bins will now be changing. Here at Green Think, we hope to improve the go green mentality through our efforts, no matter the changes in the rest of the world. The sixth largest import from the United States to China has been our waste. For years China would take the plastic depending on its ranking. These items were numbered one through seven. Something ranked at a one would be a dish soap bottle or a similar hard plastic. Ranking in at number two would be a milk jug, and so on through seven. The second the recycling left your home and entered the waste management system, it started a journey that usually ended on the other side of the planet. It was the perfect cycle: we send the recycling to China, they turn it into products and packaging, and these products are sent back to us. But the world’s largest recycling importer says no more. Since January, the waste has no longer been accepted, leaving many to question, “What’s next?” for Utah’s waste management (and even for China’s economy which has been so dependent on these go green systems). While China has decided to turn away most of the waste that’s directed to them, they are still accepting some hard plastics (think one and two on the scale). However, this is very restrictive, as they now have implemented a contamination ban of .5 percent. This new rule means that if there’s more than .5 percent of waste that doesn’t belong—plastic wrap, light packaging, cardboard, etc.—then they will turn it away. This powerful nation is making these changes in an effort to keep their home cleaner. By redirecting their waste management efforts, they can take care of pollution that has truly become an issue for them. If nothing else, this is a chance for us to really zero in on our own recycling efforts, and make sure that we take sorting seriously. Though this rule has been in place since January, we haven’t quite started feeling the change until now. The hold up comes from the lack of a place to put this waste, and we don’t want it finding a home in our landfills. It’s predicted that Oregon, California and Washington will be the places that bear the brunt of this decision, due to the fact that they’re old pros at the recycling game. It’s also up in the air as to what China’s economy will look like. By taking in the world’s recycling, they have been able to reuse resources that would otherwise end up in the trash. With less need to create new items, it’s been purely profit. Their own consumption habits have placed them in what we would consider middle class consumption patterns. The rest of the world will be watching anxiously to see what this means for the giant and if a negative outcome will shift this decision. What Does This Mean for Utah? If you’ve got a recycling program already in place, then you’re probably among one of the many Utahans who is on the “oops” program. Educational efforts have begun to improve sorting starting in your home. In fact, 27,000 fliers were printed and attached to garbage cans around the valley. In the case that a waste management expert comes across things like cardboard pizza boxes, glass bottles or plastic bags in your bin, you get an “oops” tag. You have three strikes before your recycling bin is at risk of being taken away. This effort to increase sorting in the home, increases the chance of our recycling programs remaining economically viable in the state. However, who has the time to sort through these items after a long day at work? In an effort to combat this recycling contamination, we’ve decided to expand our services at Green Think. For a little extra cost on your part, we’ll not only collect your recycling, but we’ll also sort through it to guarantee that there are no slip ups or “oops” tags. 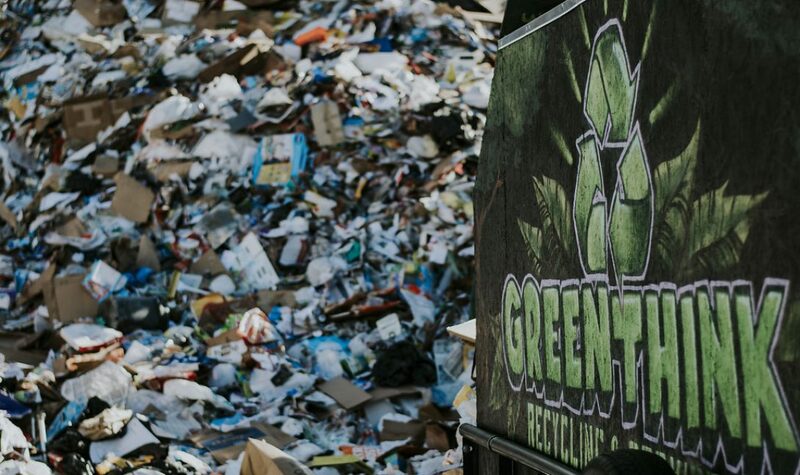 Because we see recycling as such a vital key to maintaining the health of our planet, we want to do whatever it takes to guarantee that your waste ends up being reused instead of sitting in a landfill for decades to come. Contact us now to get an idea of what a sorting program can look like for your home and lifestyle. We can hope that this change in recycling exports will reduce the amount of waste we create, but that’s not likely to happen. However, we can make a change within our country. We’ve been depending on other nations and their recycling technology for far too long, burning fossil fuels to make our waste disappear. This only furthers the problem in another channel. It’s time that our country finds a way to recycle all of our resources and bolster our own economy. The opportunity to become independent starts now. And at Green Think, we’re more than eager to watch these changes happen. Previous Post How Many Times Can Recycled Items Be Recycled?